Are you looking to hire a firm for eavestrough & gutter cleaning in Ottawa? Cleaning the gutters is crucial for winters and spring both. Every homeowner in Ottawa strives to have a clean leaf-free unclogged eavestrough that performs effectively. Avoiding it can surely result in expensive water damage. Don’t waste your weekend trying to clean it yourself? 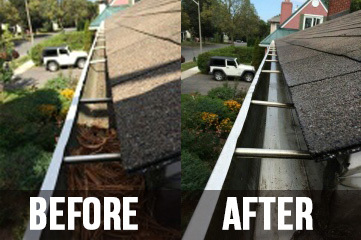 Our Ottawa gutter & Eavestrough cleaning service takes care all by themselves. Our crew ensures that the eavestrough does not have any debris or leaves. The solids are removed throughly. Effective water flow is checked right down to the downspouts to ensure rainy season passes peacefully. If required, your team can also install leaf strainers to avoid any future clogs. Serious clogs are removed by flushing the downspouts after unscrewing them. All the obstructions will be removed and organic material will be removed safely. There are numerous choices for gutter & eavestrough cleaners in Ottawa. But we work with a difference. You can trust us to clean thoroughly for it to last many months. Our crew offers you significant savings compared to other Eavestrough installers Ottawa. Our thorough inspection and cleaning of eave interiors prevents any downspout blockage. Clogged downspouts are unblocked, snaked and re-assembles back. After final inspection, you will be delighted to notice that rainwater behaves as its supposed to be. Timely action can prevent severe water damage. You must ensure downspouts are not holding rain water and are damaged. Professional gutter cleaning solutions in Ottawa can not only prevent water logging but also increase the life span of your home in general. The savings are significant in the long term. Pro Form Eavestroughing Inc. has experienced staff for eavestrough & gutter cleaning. Our timely and cost-effective solutions ensure that your eaves are in proper working condition. Do not ignore eavestrough cleaning until it is too late. Beware – you might have to spend thousands of dollars in water damages later resulting from eavestrough maintenance neglect. Experience all-year performance from your eavestroughs and peace of mind. We serve both residential and commercial clients. Call Pro Form Eavestroughing Inc. eavestrough cleaning Ottawa team today.